An intersecting ridge beam is framed into the rafters on the north side of the house. This beam is designed as a double cantilever, extending out over two columns to support loads at each end. 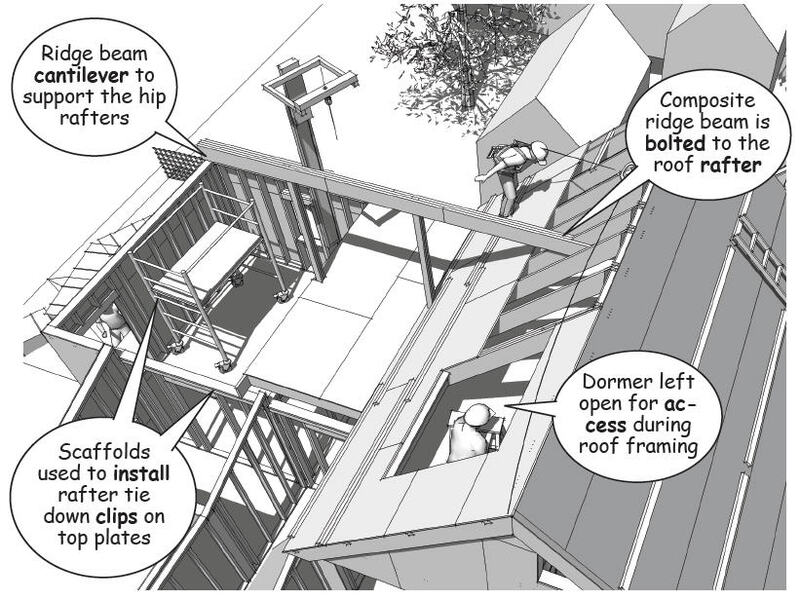 The intersecting ridge beam bears on columns that carry the roof loads down to the foundation wall. Solid blocking is added between the floor joists under the columns to maintain full bearing. The cantilever transfers the weight from the roof to the column, minimizing the load on the rafters at the intersection. 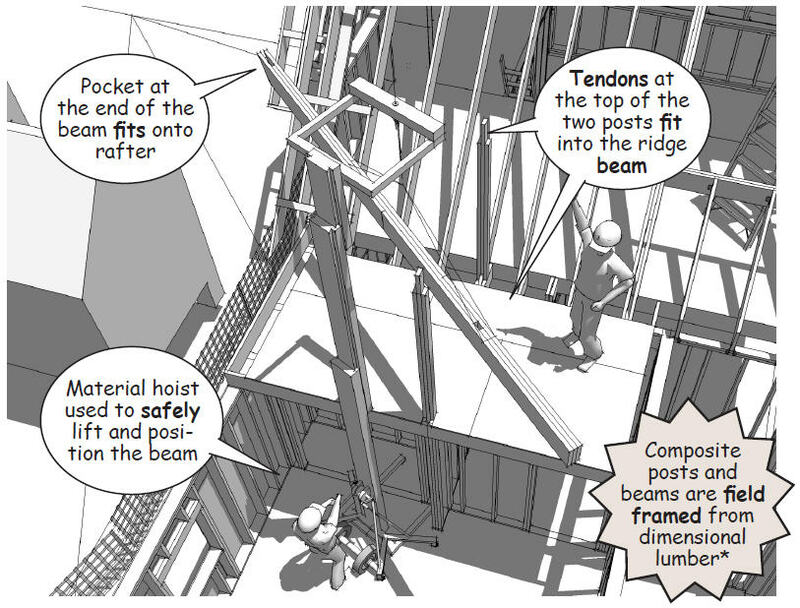 The framing members of the composite beams and columns are spiked and glued so that they “sandwich” each other at the rafter connection, similar to a furniture maker’s mortise and tendon joint. This reduces the need for moment connectors, making it possible for the pieces to be bolted together. 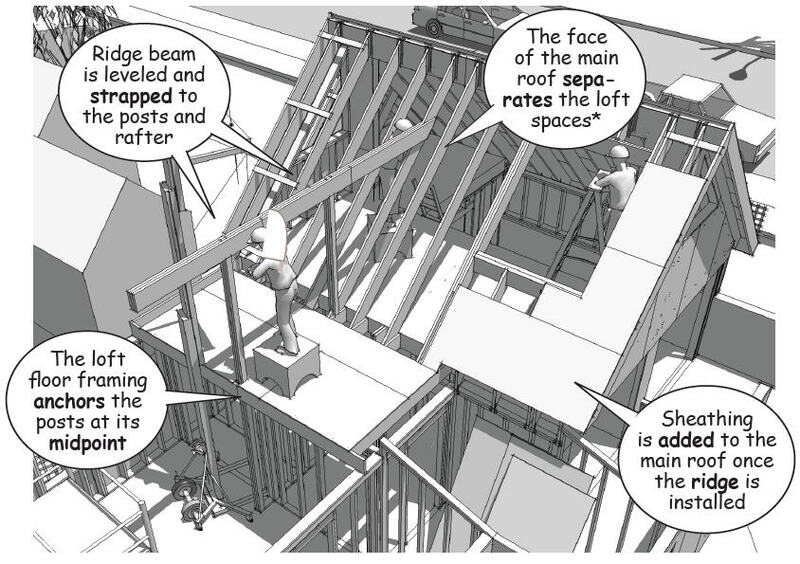 Once the ridge beam is in place, sheathing is nailed to the rafters to strengthen the frame and enclose the loft. 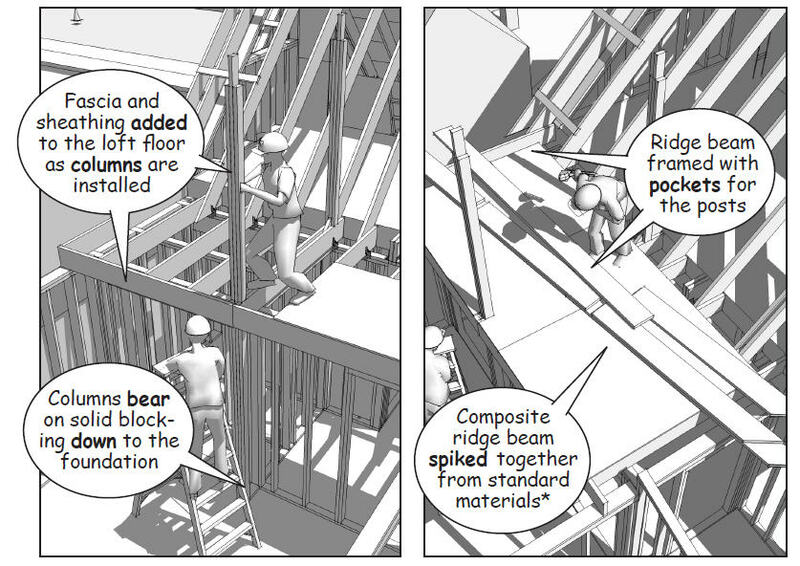 On the opposite end, the ridge beam extends out over a second column to support the hip connection, eliminating the need for a truss or bearing wall at this point. The cantilever transfers the loads from the hip connections back to the column and down to the foundation. 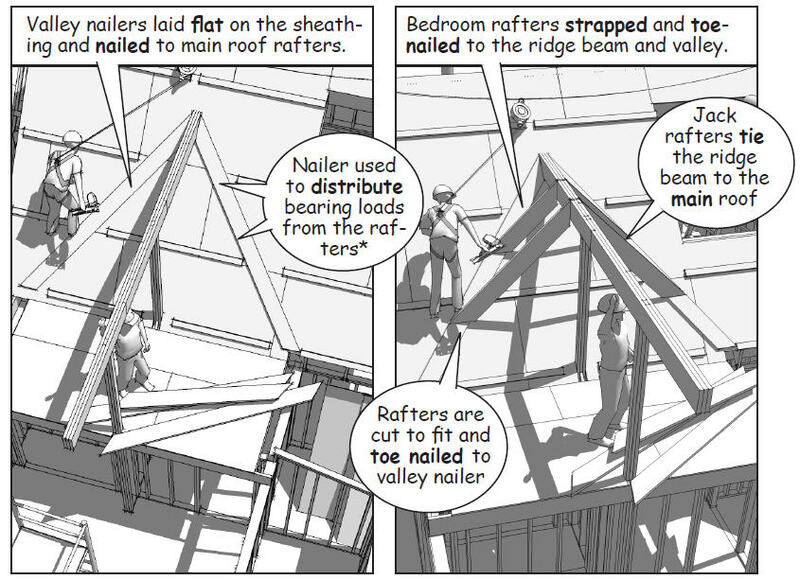 Once the ridge beam is in place, sheathing is completed on the north roof so that “jack rafters” can be connected to sleepers lag bolted into the rafters of the main roof. 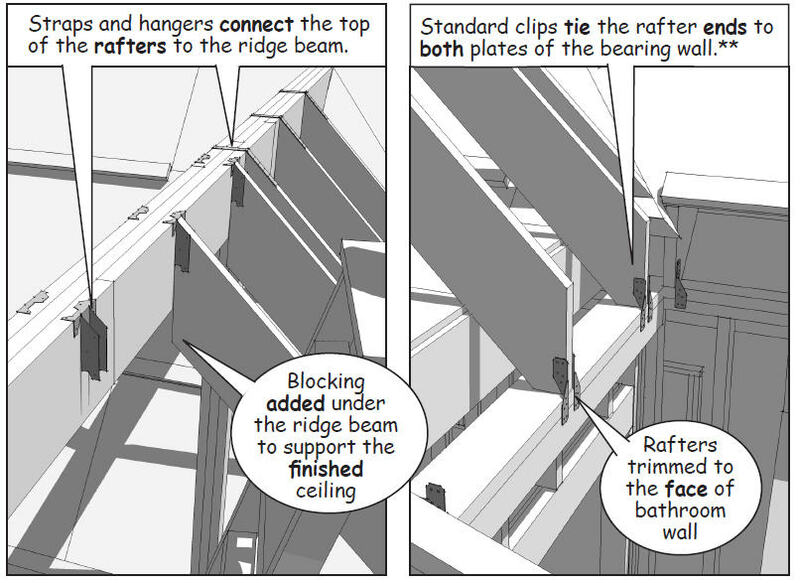 Structural clips are used along the ridge beam and the interior bearing walls to counter the uplift loads that occur in the valleys at the roof intersections.